So finally you have come on the close decision of packing your bags to visit some of the fascinated places where there is no one between you and nature. Well, a great decision to forget office pressure and domestic tensions for some time. But, the main question is that where to go. If you are confused about the selection of right and picturesque place, you have a better place to make your dream come true to come close to Mother Nature in the state of Himachal Pradesh. Be the part of Chail tourism and you will feel the presence of Mother Nature. Chail, the most amazing and picturesque Chail hill stations in Himachal Pradesh has been the ever shining star in India tourism. Located at the distance of around 45 km from Shimla, the beautiful tourist destination attracts tourists from all over the country and worldwide. This beautiful hill station that once used to be a simple and serene village today stands as a paradigm of beauty and serenity. The region is drenched in the most colorful hues of tranquility and material peace that go hand in hand. Chail is what calls every one a true paradise for travelers. The hill-station is nothing less than the Promised Land that every voyager longs for and wishes to visit. As far as tourist attraction and tourist places in Chail are concerned, they are abundant in number. Some of the picturesque places include Sidhi Baba kaMandir, Maharaja’s Palace, Chail wildlife sanctuary and cricket grounds are names a few that are famous to visit in hill station. It was the summer capital of king of Patiala named Maharaja Bhupendra Singh Ji. Later, the British Army Commander-in-Chief, Lord Kitchener sent Maharaja in Chail as his exile in the year of 1891. Just like most of the famous attractions, Sidh Baba Ka Mandir is another highlight of Chail that every traveler must visit once. Another famous attraction here is the cricket ground that stands at a height of 2144 meter above sea level. The region is also home to some of the most varied species of flora & fauna like Ghoral, Khalij, Sambhar, Jungle Fowl, Cheer Pheasants and so on. The region is outnumbered with numerous trees and lush greenery that offers the most pleasant sight to every traveler. Shimla is very close to Chail at the distance of 45 kms. The capital city of Himachal Pradesh – Shimla has a domestic airport where there are regular flights from Delhi and other cities. Chandigarh is also another main airport at the distance of 120 km from Chail. You can take taxi from Shimla or other cities of Himachal Pradesh along with Chandigarh, Ambala and Delhi. Regular buses are also run by Himachal Roadways to Chail from Shimla, Dharmshala, Solan and other cities. Mother Nature has gifted some parts of India with her true beauty that lies in everything. Himachal Pradesh – the home of snow, sky-touching mountain ranges, deep dense valleys, greenery and crystal clear water rivers, is also one of them. The small yet beautiful hill state in Northern Part of India is blessed with natural beauty that lies in Pine, Deodar, Apple and different other orchards and forest ranges, deep valleys, snow-capped mountain ranges, monasteries, rivers and a lot more. As far as Himachal Pradesh is concerned, it is a home to different world-famous hill stations. Among all the beautiful hill stations, the popularity graph of Chamba tourism is always found on ever increasing. Having been on the forefront in Himachal tourism map, Chamba Sightseeing is sure to attract honeymooners, nature tour lovers, adventure tour enthusiasts and those who want to spend some days in serenity. King gave the small town or capital name Chamba on the name of her daughter Champawati. Moreover, he also built a temple after her daughter’s name. Still, you will see her statue in the temple. In other words, she is worshipped in the temple as Goddess Chamba where devotees from different parts of Himahcal Pradesh come to pay homage to her. Talking about places to visit in Chamba, they are in abundant and give enough reasons to stay for more days. In the real way, Chamba Sightseeing is showing you the real image of Chamba tourism. Talking about the tourist places in Dalhousie, they are abundant in number. Panchpula waters, for instance is one fo the fascinating lake here that is perfect for water sports. On the other hand, the beauty of mesmerizing scenic landscape, area of karelanu and the natural springs of Karelanu will take you to the land of greenery and picturesque beauty. In addition, some of the amazing and naturally rich tourist places to visit in Dalhousie include Bakrota Hills, Village Lohali, Gandhi Chowk, Sadar Bazar, Panchpula, Tibetan Market, Khajjar and the list goes on. Small and sloppy streets, roads, deep dense valleys, and the panoramic view with the presence of serenity also add more spark in the popularity of Dalhousie tourism and make it a must see hill station in the state of Himachal Pradesh. If you stay for a few more days (two or three days or more), then visit other popular tourist places in Dalhousie that include Kalatop, DakshinaMurti, Shivkul, Norwood Paramdham, Laxmi Narayan Temple, St. Francis Church, Radha Swami SatsangBhawan, St john’s Church, and the list goes on. Handicraft centers also make Dalhousie tourism shine on the global tourism map. For handmade chapels, woolen clothes, dolls, shawls and mats, it is the only destination in Himachal Pradesh. Your planning for the next holidays is on cards; but confused where to go. Grand wedding celebration is over, now, it’s time to book the tickets for honeymoon or get an affordable yet luxurious honeymoon package for a place where you, your darling and the serenity come close to each other. You want to feel the presence of Mother Nature, but still not decided which place would be suitable for you. Such questions often come in mind and sometimes confuse you, when you plan to spend out the time in luxury for the rejuvenation of your body. But, you search ends here; you have a better place full of natural beauty to explore the true beauty of Mother Nature. The Northern Indian State – Himachal Pradesh is filled with hill stations that are globally famous and develop a unique image of Himachal Tourism on the global tourism map. Dharamshala tourism is also one of them. Being an indispensable part of Himachal Pradesh, Dharamshala Sightseeing is sure to keep tourists, especially honeymooners, nature tour lovers and adventure tour enthusiasts spell bound. Surrounded by lush greenery, cool climate, deep dense forest ranges, snow-capped mountain ranges, monasteries, and crystal clear water sources like springs, fountains, rivers and lakes, Dharamshala tourism brings new energy, new hopes and pleasing experience to your life. The beautiful hill station in the state of Himachal Pradesh is on different altitudes ranging from 1300 meter to 1700 meter. McLeodGanj is the main town that adds more spark in the popularity of Dharamshala tourism. A picturesque and eye-catching slope spread in an area of 8 km is Dharamshala that is also counted as the main hub of Tibet culture and Buddhism. There are a number of places to visit in Dharamshala that will keep nature tour enthusiasts and honeymooners spell bound. Book Dharamshala tours for some more days as the entire hill station and its surrounding areas are full of natural beauty, golf courses, cricket stadium (the only one International cricket stadium in Himachal Pradesh) and a numebr of prehistoric to contemporary monuments. Chamunda Devi temple, Norbulinka institute, Nurpur Fort, St John’s Church in Wilderness Dall Lake, e and MaharanaPratapSagar or Wild life sanctuary, are names a few that will be perfect time-spending destinations in the hill station. In addition, Kangra Art Museum, war memorial and Namgyal monastery are also must see tourist places in Dharamshala to explore. One of the most beautiful hill stations of Himachal Pradesh, Kangra is renowned in history for being the capital city of the Chand dynasty. Being one of the most scenic valleys of the lower Himalayas, sheltered by the moving Dhauldhar hills, Kangra offers various adventure sports like trekking, rock climbing, mountaineering and fishing to the fun seekers. Kangra is very famous for an historic temple namely Jwalaji Temple. Located 34 kms in the south of Kangra, the temple is dedicated to Goddess Jwalaji. A miracle in itself, it is perhaps the only temple in India where natural flames come out from nine different rocks in the temple. Abundant historical evidences state the importance of this temple dating back to the reign of Mughal Emperor Akbar. The emperor under the influence of his royalty tried to test the prowess of the Goddess. He tried enormous ways to extinguish the flames but in vain. At the end, bowing to the Goddess, he tried to please her with a Golden Chhatra. But the Goddess did not accept it and the Chhatra fell on the ground turning into a colossal metal, the compositions of which are yet unknown. Brajeshwari Devi Temple is another tourist attraction at Kangra. This Temple is a witness to the devastation by Mahmud of Ghazni in 1009. In 1905, Kangra was destroyed by an earthquake. Rebuilt in 1920, Kangra still is a legendary pilgrimage centre of Himachal Pradesh. Kangra also has a legendry fort belonging to King Kotch. The fort is situated at a considerable height overlooking Ganga and Manjhi rivers. Kangra is easily accessible from rest of the country. It is well connected by rail, road and air. The nearest airport is Gaggal airport which is at 13 kms from Kangra. Other important airports of major cities like Jammu 200 kms, Amritsar 208 kms and Chandigarh 255 kms are well connected from Kangra. The nearest broad gauge railhead is at Pathankot which is 90 km from Kangra. A narrow gauge railway line between Pathankot and Jogindernagar passes via Kangra, 17 kms from Dharamshala. Apart from rail and air, Kangra is also well connected by road. This town is easily accessible from major cities of the region. Palampur is rich with its tea gardens and has the beauty of the Dhauladhar Hills. Here, you find valleys, mountains, lush greenery and attractions including Mata Bundla Temple, Newgal Park, Saurab Kaliya Ban Vihar, St. John’s Church, Neugal Khad, etc., that together form the wonders to be explored in Palampur……….. Entire Himachal Pradesh is full of lush green forest ranges, valleys, snow covered mountain ranges and rich flora and fauna. Palampur Himachal Pradesh is also one of those beautiful places that attract people from all parts of the country and even from other parts of the world. Every year, thousands of honeymooners, nature lovers and couples prefer to explore the rich beauty of the small hill station yet beautiful city. Deriving the beautiful name from the popular word “Palum” that means plenty of water or abundant water. The most amazing city is located at the altitude of 1220 meters near Dhauladhar range just 35 km from Dharamshala. As far as the history of Palampur tourism is concerned, it was unknown until the superintendent of biotechnological gardens, Mr Dr. Jameson who are also known to be the revolution person of Tea Plantation from Almpra in the year of 1849. According to history, this tea plantation was also considered as the main point that attracted European Tea Estate owners. And since then the place is known to be the tea capital of North India that is surrounded by tea gardens. In addition to the tea plantation, the estate and Palampur is also famous for ancient architectural wonders. And it is due to the fact of the influx of tourist and tea estate owners from Europe who developed their residential and commercial buildings. Before the arrival of Europeans, it was the kingdom of Sikhs, the most stunning hill stations of Jalandhar. Today, Palampur has become the major tourist attraction and hill station in the state of Himachal Pradesh. Today, the place and its surrounding area is full of major attractions that keep tourists mesmerized for a long time and persuade them to come here again and again. Talking about attractions in Palampur deeply, then Newgal Park is one of the main places to explore in Palampur that comes in the way of Mata Bundla Temple. In addition to this, Neugal Khad or Small River and Sourab Kaliya Ban Vihar are also worthwhile to explore in the city and hill station. In addition to this, St John Church is also an attractive place in Palampur. It was rebuilt in 1929 that is very close to the Government College. The popular hill station of Palampur is very close to all the major hill stations and cities of Himachal Pradesh. Palampur is also very close to Gaggal airport in Kangra that is only 37 m from Palampur. However, it is well connected via rail and road to all the major cities of the country. Phathankot is the very close railway station to the hill station of Palampur. 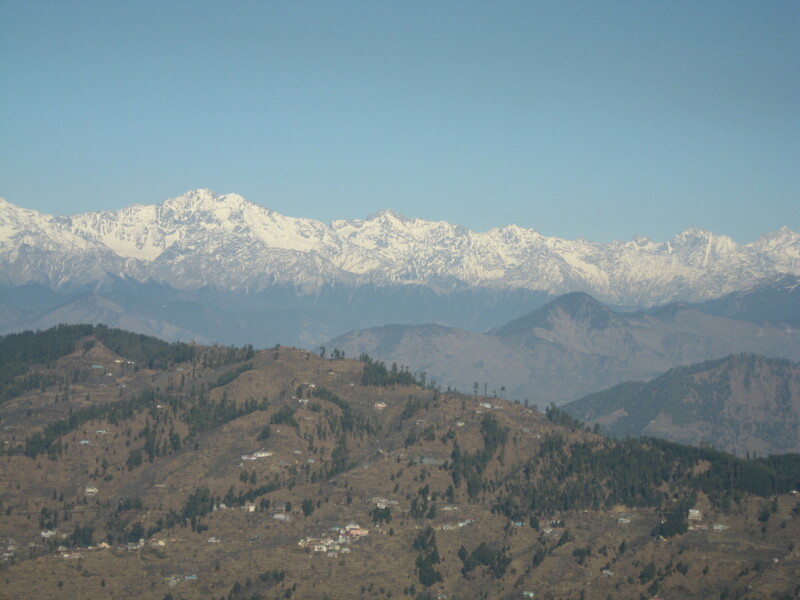 Moreover, Moranda is only four km from the hill station of Palampur. Moreover, Palampur is also well connected to Dharamshala ( 40 kms), Kangra (40 kms) Kullu (165 kms), Mandi (96 kms) and Shimla (259 kms). In addition to this, there are also a number of hotels, resorts, lodges and other accommodation options here. There are also a number of restaurants and other local Dhabas where you can enjoy the best food of Himachal Pradesh. So what you are waiting for, come to Palampur and enjoy the natural beauty here. In fact, entire sate of Himachal Pradesh has been gifted with natural beauty, snow-covered mountain ranges and lush green forest ranges. But the attraction and the charisma of Kinnaur are unexplainable. Kinnaur is one o the most beautiful hill stations and district of himacal Pradesh that is known for lush green valleys, orchards, vineyards, snow capped peaks and cold desert mountains and all those you have wished to have at a beautiful and naturally rich place. Located at the distance of 250 kms from the state capital Shimla and well connected via national highway number 22, Kinnaur is also a rich region in the state that is known as the land for growing fruits like Apple, almonds, peaches, pine nut, apricots and the list goes on. Kinnaur tourism is also famous for local wine named Anguri that is formulated by fruits and certain grains. Naturally rich and full of lush green forest ranges of Oak, Chestnut, Maple, Birch, Alder, Mangolia, etc., Kinnaur is all time favorite hill station among honeymooners and those who love to explore the real natural beauty in their own way. In addition to this, there are also a number of adventure tour spots where tourists, especially adventure tour enthusiasts can enjoy the adventure sports in their own way. Rivers are also the main attractions here that make it a one stop destination for river rafting. Sutlej, Spiti, Baspa River, etc, are some of the main rivers that covered the Kinaaur area and make it most rich region for fruits and crops in the state of Himachal Pradesh. 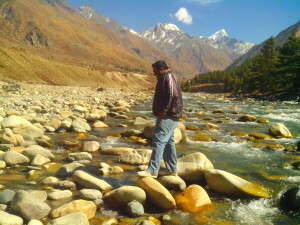 Sutlej River also divides Kinnaur in two parts. On the other hand, the Spiti River is the second most important river of the Region that is also the main water sources of the country. Talking about the attractions in Kinnaur, the entire state is full of attractions like temples. One of the most visited temples in Kinnaur is Recong Peo that is renowned for its Gompa, where His Holiness the Dalai Lama accomplished a ‘Kalchakra’ ceremony in 1992. Positioned at an altitude of 1,899 meters, another popular attraction is Karchham that is famous tourist spot for its picturesque view that also is a convergence point of the Satluj and Baspa rivers. Needless to say, it is one of the most beautiful places to explore in the state of Himachal Pradesh. Now, there are also a number of luxury hotels, resorts and a number of other accommodation options here. In this way, accommodating here is not a major issue. 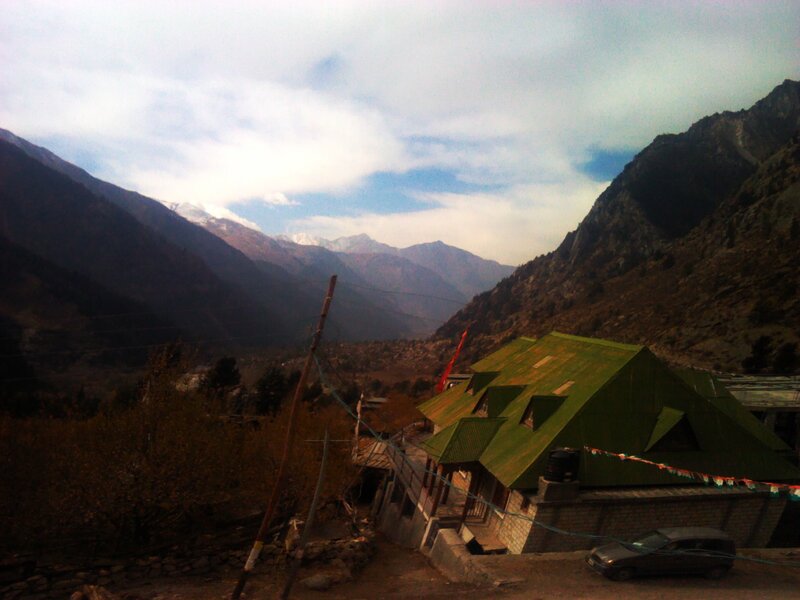 Moreover, there are also a number of restaurants and other food options in Kinnaur where you will also get an opportunity to enjoy local foods. 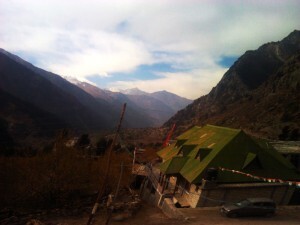 So what you are waiting for, come and explore the real beauty of Kinnaur in Himachal Pradesh. Earlier Lahaul and Spiti were two different districts of the State of Himachal Pradesh, Kardang was the capital of Lahul and Dankar the capital of Spiti. Finally the two districts were merged and found status of a district in 1960. The district is popular for its heritages and ancient places. Snow covered peaks, deep gorges, lush green valleys, speedy flowing rivers, attracting mountain lakes, striking temples and monasteries are the main tourist attractions in Lahaul and Spiti. This district also can be visited for relaxing, sightseeing, trekking, mountaineering, fishing, para-gliding, skiing, ice skating and golfing. 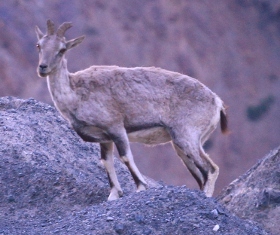 Tibetan antelope, Tibetan argali, Kiangs, musk deer, and snow leopards are the rare animals which can be viewed in Lahaul and Spiti. Popular as the oldest monastery in the Lahaul valley, Guru Ghantal monastery is a wooden structure with pyramidal roof. The annual festival of Ghantal is celebrated in mid June with high spirit. 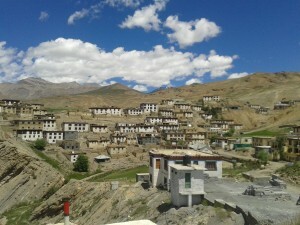 Keylong is a one of the most tourist attractions in Lahaul and Spiti valley. This place is a district headquarters of Lahaul and Spiti. Gondla is another tourist attraction near Lahaul and Spiti. This region offers some royal heritages. In Gondla, the eight storeyed house of the thakur of Gondla is a popular heritage to visit. This monument called the Gondla Castle or fort was constructed in the 17th century. Lahaul and Spiti is well connected through rail, road and air network. Lahaul and Spiti is well connected from major cities of state like Manali, Pangi & Leh and so on. From here, buses and taxis are available to reach Lahaul and Spiti. Lahaul and Spiti can be reached from shimla via Kinnaur because; Shimla is well connected through rail, road and air from rest of the state. Lahaul and Spiti can also be reached by Manali via Rohtang Pass because; Manali is connected by rail, road and air. Kinnaur is located in the North-Eastern part of Himachal Pradesh. Kinnaur shares its Eastern boundary with Tibet. The Zanskar mountains form the international frontier betweenKinnaur and Tibet. Kinnaur is a tribal area of Himachal Pradesh in true style. 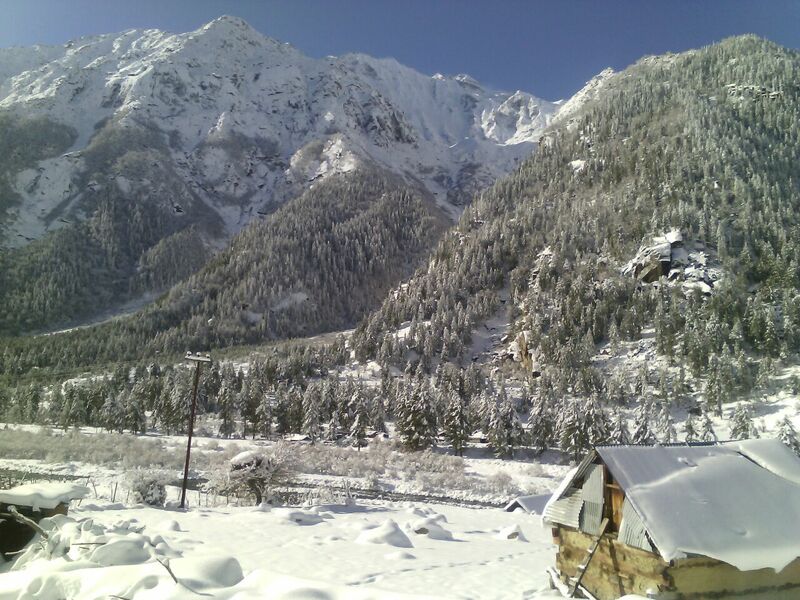 The breathtaking Sangla valley offers the visitors the breathtaking view of captivating lush green orchards in the lap of majestic mountains covered with pure and dazzling white snow. The district has a number of valleys varying in altitude from 1000 metres to 4000 metres. The main of them are - The Satluj valley, The Hangrang or Spiti valley, The Ropa or Shiasu valley, The Baspa or Sangla valley and the Tidong valley. Among these, theSatluj valley is the largest river valley of the district and traverses for about 140 km. in the region. The gushing rivers of Kinnaur abound in Trout, the angler’s prize catch, their waters have over the centuries chiseled beautiful gorges across this picturesque land and nurtured one of the most unique societies on there banks. In the lush land live the descendants of the Kinners, the demi gods of the Hindu pantheon, whose deeds have been immortalized in epics and the poems of ancient Sanskrit poets. It is no wonder that a local tradition maintains that Kinnaur with all its beauty fell from the clouds as a gift from the gods. Tourism in Kinnaur offers a completely different kind of experience in true tribal sense.Kinnaur has some of the most beautiful valleys on earth full of deep gorges, rivers and breathtaking landscapes. It is like a fairy land. Tourism in Kinnaur offers numerousfamous places i.e. Sangla, Rakchham, Kalpa, Kothi, Nako, Recong Peo, Chitkul, Chango, Morang, Lippa, Nichar, Karchham etc. Many of these places are natural paradises. 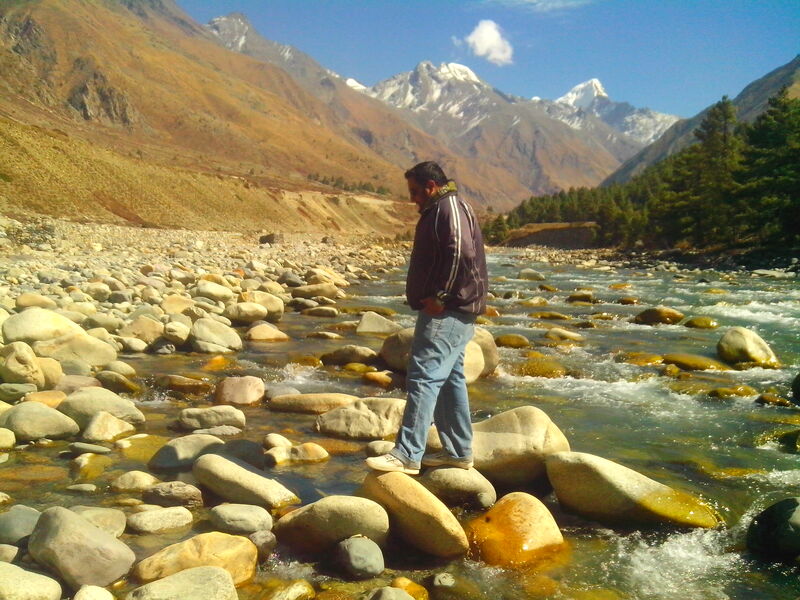 TheSangla Valley is a breathtakingly beautiful valley. As in a typical religious place in Himachal, a number of fairs and festivals are celebrated in Kinnaur every year i.e. Lavi fair, Phul Yatra fair, Sazo festival, Phagul or Shuskal festival, Beash, Dakhraini festival, Phulech festival, Lossar festival and Tribal festival. There are a number of beautiful temples in Kinnaur i.e. Chandika temple, Chango temple, Durga temple, Charang temple and Mathi temple. There is a beautiful Nako lake situated in the Nako village. The location of the village is striking. 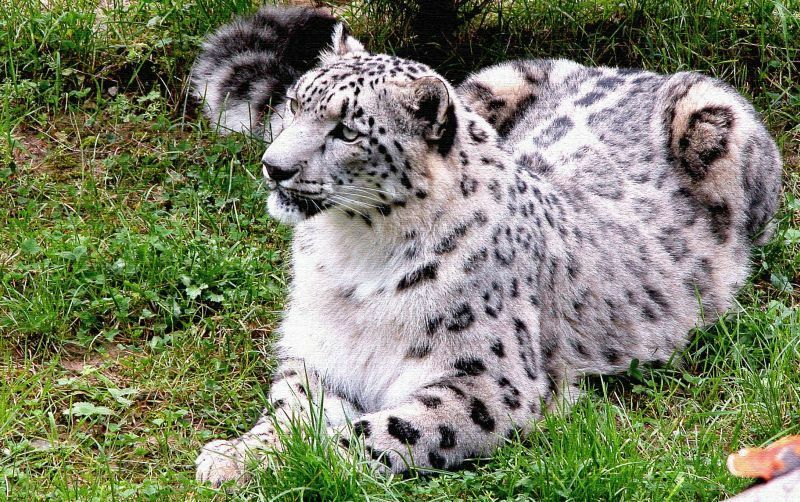 Tourism in Kinnaur offers a number of wildlife sanctuaries to explore i.e. Lippa Asrang sanctuary, Rakchham Chitkul sanctuary, Rupi Bhaba sanctuary. These wildlife sactuaries are heavens for any wild life lover. 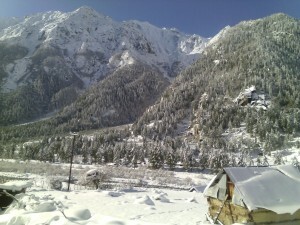 Kinnaur is easily accessible from Shimla via Rampur. The road from Rampur to Kinnaur is a thrilling experience. The supreme natural beauty full of deep gorges, rivers and beautiful landscapes is the prime feature of tourism in Kinnaur which sets it apart from other tourist places of Himachal. It is the prime destination of Tribal Voyage in Himachal and one of the finest places in Himachal to explore. There is no direct flight to Kinnaur and the nearest Airport is Shimla which can be reached from Delhi. Shimla Airport is at Jubbarhatti, 23 kms from city and is connected to Chandigarh, Kullu, Delhi. It has daily flights from Delhi and Kullu. On Tuesday and Thursday Jagson Airlines flies Delhi-Shimla-Kullu-Gaggal and return. Archana and KCV fly between Delhi and Shimla on Monday, Wednesday and Friday. With drive to kinnaur very adventerous, care is to be taken while driving. Long suspension bridges connect two bank of the Satluj river at many places. The road condition after the flash floods in August,2000 is not the best. With blocks in some places in winters and rainy seasons it is always advisable to get information about the road condition and then start the journey in these months. The other route from Manali-Kaza-Recong peo remains closed in most part of the winters and springs. Kinnaur is situated 77°45′ and 79°00’35” East Longitudes and between 31°55’50” and 32°05’15” North Latitudes. Kinnaur shares its Eastern boundary with Tibet. On the South and South Eastern sides, it has Uttar Kashi district of Uttar Pradesh. On the Western side lies the Shimla district and on the North and North-West is situated Lahaul and Spiti. varies from 2,550 metres to 6,791 meters. One can travel in a taxi or jeep on National Highway 22 for the entire journey from Kalka to Kinnaur. Some of the parts of journey can be done by long route buses run by HRTC. Distance from Shimla to Kalpa is 244 km., Delhi 590 km., Kullu 267 km. The summer temperatures range between 6° C and 25° C, while the winter temperatures usually remain between -1° C and 0° C. Days from April-Oct are warm, early morning & evenings being colder, light woolens May-July and heavy woolens in rest of the season. 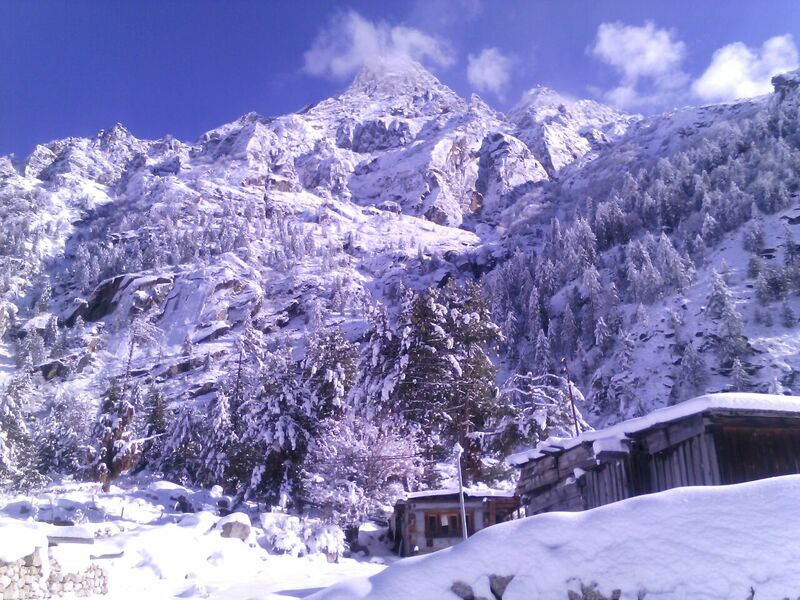 You’d enjoy the Summer months in Kinnaur because of warm temperatures. ( 2,680 metres ) It is an important village of the Baspa valley situated on the right bank of Baspa river is built on a slope with houses rising one above other with gigantic ‘Kinner Kailash’ peak ( 6,500 meters ) towering from behind is also famous for ‘Kamru Fort’. This fort was the place where so many Rajas of Kinnaur were crowned. The entire place is adorned by soothing saffon fields and alpine meadows. ( 2,900 metres ) Its name has been derived from ‘Rak’ a stone and ‘Chham’ a bridge. The location of the village is striking. It is located on the right bank of the Baspa river. It is said that in the earlier time there was a natural stone bridge over the Baspa river hence the name of the village. ( 2,670 metres ) It is one of the main villages of the district connected by link road 14 km. from Powari beyond Rekong Peo. Looming in front of Kalpa is an imressive view of ‘Kinner Kailash’ directly across the Satluj river. This mountain changes colors several times a day with a change of weather conditions or may be as destined by Lord Shiva his eternal abode. ‘Parvati Kund’ is located on the top of Kinner Kailash. 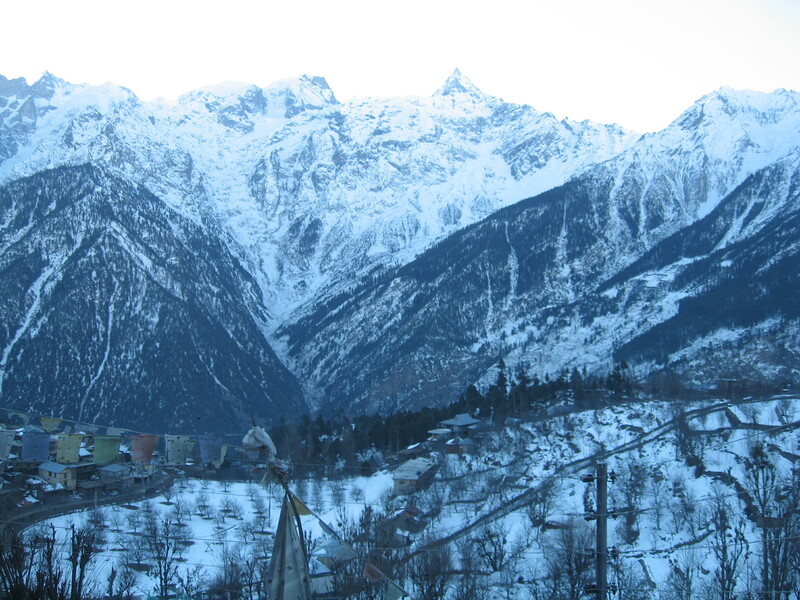 The ancient villages of Pangi, Moorang and Kanum are situated close to Kalpa. It is also called Koshtampi. It is little below Kalpa proper and it is overshadowed by Kinner Kailash peak. Goddess ‘Shuwang Chandika’ temple is a famous one in the village. The village with its attractive temple, gracious willows, green fields, fruit trees makes an altogether a beautiful landscape. ( 3,662 meters ) It is the highest village in the valley and the existence of lake formed out of the masses of ice and snow above adds to beauty of the village. Situated about 2 kms. above the Hangrang valley road and is 103 kms. from Kalpa on the western direction of the huge mountain of Pargial. Local village deity is Deodum and another Lagang temple with several idols exist here. There is a staying hut for visitors. Reckong Peo is situated at an altitude of 2670 m from the sea level, located 235 km from Shimla. It is the District Headquarter having a panoramic view of Kinner Kailash. Kinner Kailash mountain is regarded as one of the mythical homes of Lord Shiva, here is a 79 feet high rock formation that resembles Sivalinga. This Sivalinga changes the colour as the day passes. Also visible on the stretch is the peak of Raldang (5499 m). Reckong Peo has many hotels and rest houses. There is a Buddhist Monasteries in the Reckong Peo. (3,450 meters) This is the last and highest village in the Baspa valley in district Kinnaur. It is situated on the right bank of Baspa river. This is the last and highest village in the Baspa valley. There is a road along the left bank from Karchham. There are three temples of local goddess Mathi, the main one said to have been constructed about 500 years ago by a resident of Garhwal. The square ark of the goddess, is made of walnut wood and is covered with clothes and surmounted by a tuft of yak tail. Two poles called bayanga are inserted into it by means of which it is carried. The goddess has a mouthpiece. (3,058 meters) It is in Kinnaur district and is a collection of four hamlets in pargana ‘Shuwa’ sub-tehsil Hangrang, on the left bank of Spiti river. It is encircled on every side by high hills which is a witness to the presence of a former lake. This village is under the influence of Buddhism, but there are some local Hindu deities too namely ‘Gyalba’ – ‘Dabla’ and ‘Yalsa’. ( 2,591 metres ) This village is situated 39 kms. away from Kalpa on the left bank of river Satluj. The location is very beautiful and approach to this picturesque village is through apricot orchards. The local deity is Urmig and there are three structures dedicated to the deity each existing in Thwaring, Garmang and Shilling. Generally these are empty as the ark of the deity remains in the fort. On a sacred day the ark is taken to the above named places. The ark has got 18 ‘mukh’, made of silver, gold and brass. The 18 mukh represents the 18 days of the great epic Mahabharat. (2,745 meters) It is in Kinnaur, situated near the left bank of Taiti stream. Three Buddhist monasteries are there, which are dedicated to Galdang, Chhoiker Dunguir and Kangyar. 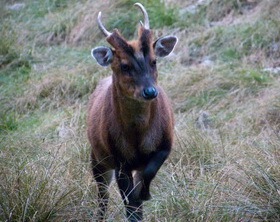 The place is also famous for Ibex found in the nearby forest. ( 2,150 metres ) This village is situated between Taranda & Wangtu on the left bank of Satluj about 5 kms. above Wangtu. The scenery is enchanting. 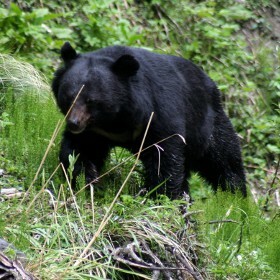 Ghoral , antelopes, black & red bears are seen sometimes in higher ranges. ( 1,900 metres ) The confluence of Satluj and Baspa rivers marks the location of Karchham on Hindustan-Tibet road. It is a beautiful place. Chango has three temples. In lower Chango, the red walls of Rinchen Zangpo temple stand out atop a little promontorybut contain little of note. Nearby, the village temple, in more regular use as a place of worship, has a large prayer wheel, clay idols and contemporary wall paintings. A large image of Avalokiteshwara, crudely carved in stone, lies on the path between these two shrines. It was found in some out of the way and the monks decided to place it in a temple but the combined strength of many men was insufficient to lift the stone. Then the present location was though. The temple in upper Chango is the best kept but of relatively recent vintage. Close by, a new prayer hall, library and guest rooms are nearing completion. There is a Durga temple at Ropa also known as the Chandika temple. Chandika had apportioned to herself this semi-arid tract when she divided Kinnaur amongst her brothers and sisters. Her temple at Ropa, a new structure with a reinforced cement concrete frame, is an artitectural malapropism. Just beyond Charang is a temple of the eleventh century known as Rangrik Tungma complex. The temple takes its name from the goddess Rangrik Tungma and her small metal image, astride a horse is the oldest at the temple. In all likelihood Rangrik Tungma must have been a pre-Buddhist deity, absorbed into the pantheon of the later religion. Two other bronze statues appear to be of considerable value; a Maitreya seated with legs pendant, in bhadrasana and a Buddha in bhumisparsha mudra. The walls of the main hall are linked with clay idols, in the same style as the mandala in the dukhang at Tabo. This temple is located at Chitkul. Mathi is the local goddess of the people of chhitkul having three temples the main one said to have been constructed about five hundred years ago by a resident of Garhwal. The square ark of the goddess is made of walnut wood and is covered with clothes and surmounted by a tuft of yak tail. Two poles called bayanga are inserted into it by means of which it is carried. This beautiful is located in the Pooh sub-division of district Kinnaur. The lake is surrounded by willow and polar trees. There is a small village on the bank of this lake – and the village seems to be half buried by the lake’s borders. On the water’s northern side, are four Buddhist temples with stucco images and murals. Near Nako is a footprint-like impression ascribed to the saint Padmasambhava. It freezes in winter and people enjoy skating on this lake. Nako : It is the highest village in the valley and the existence of lake formed out of the masses of ice and snow above adds to beauty of the village. Situated about 2 kms. above the Hangrang valley road and is 103 kms. from Kalpa on the western direction of the huge mountain of Pargial. Local village deity is Deodum and another Lagang temple with several idols exist here. There is a staying hut for visitors. Altitude : varies from 4000 meters to 5022 meters. Annual Rainfall : mean annual rainfall is 226.3 mm. Area : 3,090 hectares ( 30.90 sq. km. ). Location : nearest town is Morang. Approaches : Kinnaur to Morang to inside sanctuary. It was first notified as a sanctuary in 1962 and re-notified on 27th March 1974. 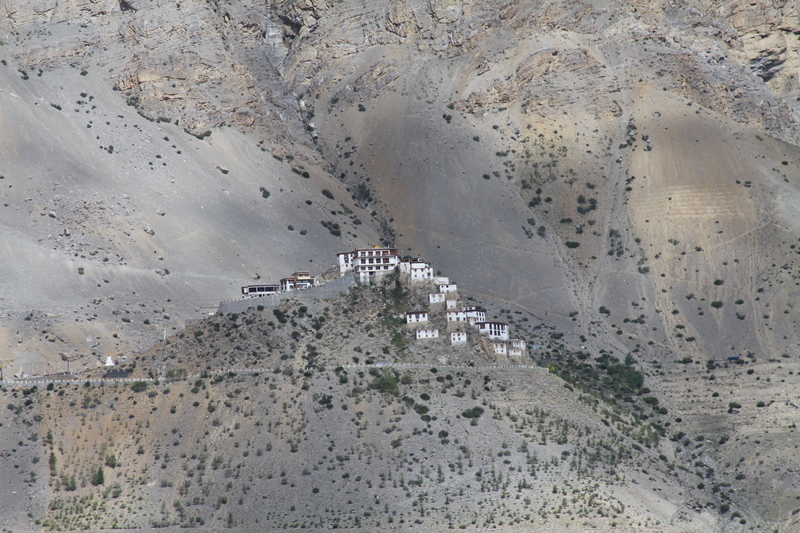 This sanctuary is located on the high altitude area and one of the few in India from where the yak has been reported, though it may well be feral. 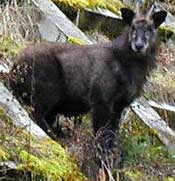 Musk Deer and Ibex are also present. The area is largely flat, like a huge plateau, and a part of it is barren cold desert. 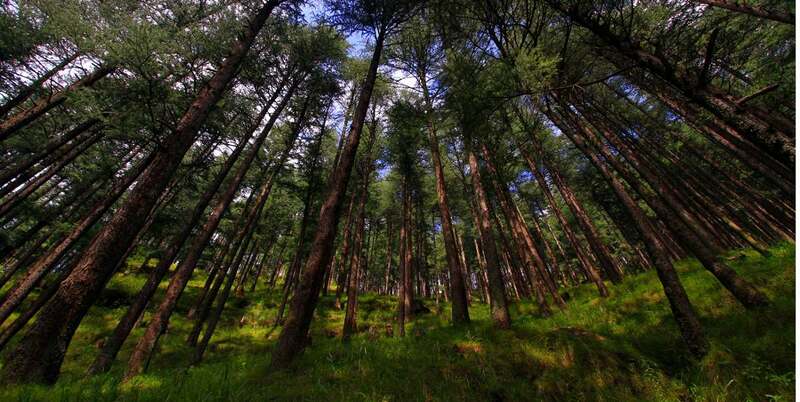 Forest types include lower western Himalayan temperate forest, upper western Himalayan temperate forest, Kharsu Oak forests, dry broad leaved and coniferous forest, dry coniferous forest, dry alpine scrub and dwarf juniper scrub. 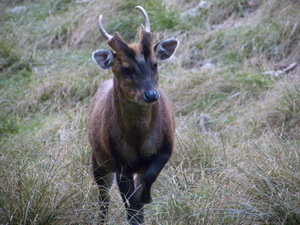 Himalayan Black Bear, Brown Bear, Musk Deer, Goral, Ibex, Leopard, blue Sheep and Yak. 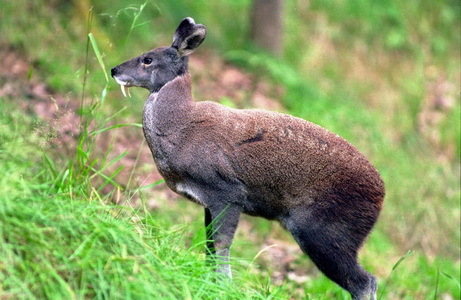 Species believed to be locally threatened are Musk deer, Leopard, Goral, brown Bear, Ibex, Monal and Himalayan snowcock. It was first notified as a sanctuary in 1962 and re-notified on 27th March 1974. 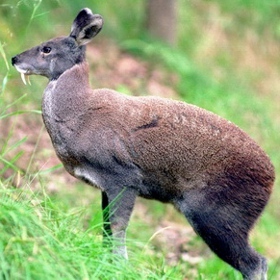 This sanctuary is located at high altitude and is a good habitat for the endangered Musk deer. Govind Pashu Vihar sanctuary in Uttar Pradesh falls adjacent to its southern boundary, and little beyond the eastern boundary of the sanctuary lies the Tibetan Plateau of China. 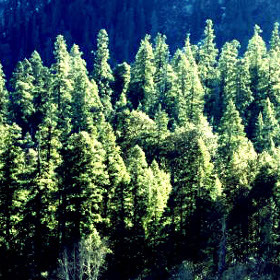 Forest types include lower western Himalayan temperate forest, upper western Himalayan temperate forest, dry broad leaved coniferous, dry temperate coniferous and dry alpine scrub. Altitude : varies from 909 meters to 5650 meters. Annual Snowfall : mean annual rainfall is 300 mm. Annual Rainfall : mean annual rainfall is 45 mm. Temperature : temprature varies from -10 to 20°C. Location : nearest town is Rampur Bushahr. Approaches : Shimla to Rampur Bushahr to inside sanctuary or Kinnaur to Rampur Bushahr to inside sanctuary. It was first notified as a sanctuary on 28th March 1982 and re-notified on 30th June 1982. A remarkably wide variation in altitudes supports a large diversity of habitats and wild life in this catchment area of the Satluj river. The Great Himalayan and pin Valley National Parks are located on its western and northern boundaries, respectively. Forest types include lower western Himalayan temperate, Kharsu Oak, dry broad leaved coniferous, dry temperate coniferous and Alpine pastures. 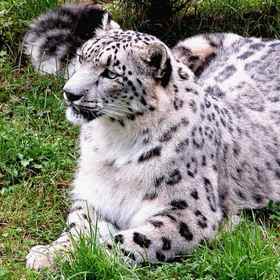 Himalayan Black Bear, Brown Bear, barking and Musk Deer, red Fox, Goral, Ibex, Leopard, Snow Leopard, Serow, blue Sheep and Himalayan Tahr. This fair is held in the month of October or November every at Rampur Bushahr. In ancient, Tibet and Kinnaur had good trade relations and Lavi fair is the outcome of business interest of both sides. People from other areas in general and tribal belt in particular participate in this fair with horses, mules, pashminas, colts, yaks, chilgoza, namdas, pattis, woollens, raw semi-finished wool and other dry fruits produced in the state are brought for selling. It is three hundred years old fair and also a state fair.4 During day time, hectic trade activities are witnessed all over the town. At night, folks dances and music around small bonfires are organised. It continues for three days. It denotes the start of a closing season in this snow bound valley. Offerings are made to local goddess, in whose honour it is celebrated. The tribal people enjoy, dance, sing and drink in gay mood forgetting everything else for the time being. In Kinnaur and Lahaul-Spiti some annuar fairs are held which have left deep impression on the community life of the tribals. One of the main features of these fairs is folk dance. Mask dance and lion dance are also very famous. Celebrated only in Kinnaur region in the month of Bhadon or in the beginning of Asauj. People from each household proceed towards hilltops to collect flowers, which are offered to village deity and afterwards these flower garlands are distributed among the people. Priest makes forecasts about crops and changes in seasons etc. Priest’s words are taken for granted by local people. Tribal Festival is being celebrated since 1994 from 30 October to 2nd November every year at District Headquarter Reckong Peo and this festival has been declared as State Level festival and has been celebrated since 1987 under different names like Janjatiya Utsav, Phulaich Utsav and also as Tribal Festival. This festival not only depicts the panorama of rich culture heritage of district but also provides an opportunity to the local people to sell/exhibit their horticulture/agriculture produce, handicraft and artifacts. Besides the Kinnauri culture groups, participants from other districts/states also present and perform culture programmes symbolising national integration and brotherhood. Please note – those who register at the expo at Banjara Camps may not get some items of the race kit or a medal at the finish line since these items will have already been orderedThose who are running the full/half marathon are automatically registered for the 10km/5km runs respectively as these are pre requisite acclimatization runs for these participants. Also book yourself for the post race party dinner on the 24th of April @ Rs500pp. Children 5 and under free and 6-12 half rates. Bib and race packet pick up is at the marathon expo at 9am – 4pm on April 20th at Banjara Camp at Batseri Village, Sangla, Kinnaur District. You have to make it in person. The runs are organised by runners for runners. Experience the thrill of a lifetime as you cross the finish line. The course is tough – so altitude acclimatization is key. with Sports Drinks, Water, Ambulance and Medical Care. Our The Half Marathon will remain open for 3.5 hours and the full marathon for 7.5 hours. An attractive medal, certificate with timing for each finisher of the Full and Half Marathon and a medal and certificate for every finisher of the 5 km and 10km runs. The race number pick up for all races will happen at Banjara Camp at Batseri Village on April 20th between 9am and 4pm. You need to be there in person as part of the strict acclimatization requirement. Do not take the half or full marathon lightly – this is both at altitude and a long steady climb and you need to be in peak condition for this. We suggest that you team up with another for doing the marathon and the half marathon as a relay if needed. The costs, procedures etc all remain the same per person whether you are running in a relay or as a single person. Plan to be at the start at least 30 minutes before the start of your race. Get as many of your family and friends to join you on this amazing holiday experience and those who are not running can cheer you. The Medical Care will be available, But this is a very remote location and you need to be your own best judge first- we want you safe and injury free with treatment close at hand if required. Please rest and ask for aid if you ever do feel dizzy or unsteady or have your heart pounding. Hydration is available at several points along the way but you will be carrying a water bottle for the same for the half and full marathon which will be provided in the running kit. If you like anything and everything about snow, you may be inspired by the meaning of the word Himachal. ‘The land of snows’, the meaning, is adequate to give you an idea of what to expect here. Himachal Pradesh is located in the western Himalayas. Surrounded by majestic mountains, out of which some still challenge mankind to conquer them, the beauty of the land is beyond imagination. Simla, one of the most captivating hill stations, is the capital of the state. Given below are some of the best himachal pradesh destinations. Sangla Valley or the Baspa Valley starts at Karcham and ends at Chitkul. Sangla is the major town in the valley with having petrol pump, Bank ATMs, Post Office, Restaurants, Bar, mid range hotels and shops. 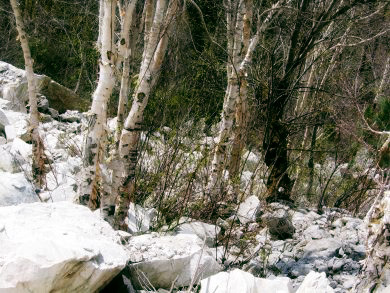 The valley is surrounded by forested slopes and offers views of the high mountains. Its location in the greater Himalayan range gives it a milder climate than the plains. Until 1989 outsiders could not enter the valley without a special permit from the Government of India, due to its strategic position on the Indo-Tibet/China border.The Baspa River flows in the Sangla Valley which is rich in apple orchards, apricot, Wall-nut, Cedar trees, and glacial streams with trout. The main villages in the valley villages include Chitkul, Rakcham, Batseri, Themgarang, Kamru, and Sapni. The nearby Baspa hydel-project has been completed in 2009. Besides the natural beauty of Great Himalaya Kamru Fort, Mata Devi Temple & Bearing Nag Temples are the main attractions of the Valley. 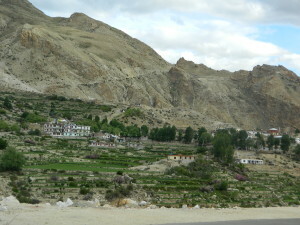 Nako is a village in the Himalayas of northern India. It is located in Kinnaur district in Himachal Pradesh. The area is known for its lake, Nako Lake which forms part of the border of the village. Nako Monastery is located in the village as well as several other Buddhist temples. Located high on a hillside (about 3600m above sea level), it receives tourists during the summer months. Tabo is a small town in the Lahaul and Spiti district on the banks of the Spiti River in Himachal Pradesh, India. The town lies on the road between Rekong Peo and Kaza (alternative spelling: Kaja), the sub-divisional headquarters of Spiti. The town surrounds a Buddhist monastery which, according to legend, is said to be over a thousand years old. His Holiness the Dalai Lama has expressed his desire to retire to Tabo, since he maintains that the Tabo Monastery is one of the holiest. In 1996, HH the Dalai Lama conducted the Kalachakra initiation ceremony in Tabo, which coincided with the millennium anniversary celebrations of the Tabo monastery. The ceremony was attended by thousands of Buddhists from across the world. Tabo Monastery’s spiritual head is Tsenshap Serkong Rinpoche. The town of Kaza, Kaze or Kaja is the subdivisional headquarters of the remote Spiti Valley in the Lahaul and Spiti district of the state of Himachal Pradesh in the Western Himalayas of India. Spiti, which is a part of the Lahaul and Spiti district of Himachal, is a high altitude or cold desert having close similarities to the neighbouring Tibet and Ladakh regions in terms of terrain, climate and the Buddhist culture. 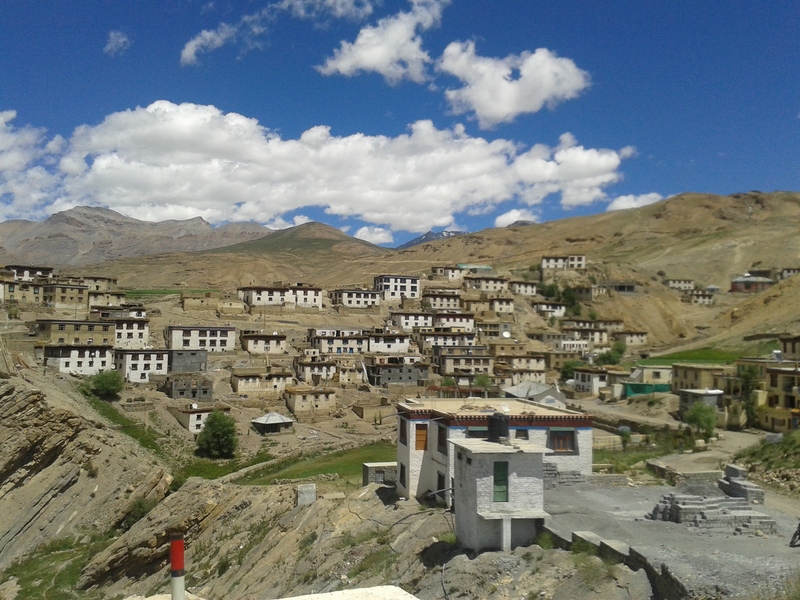 Kaza, situated along the Spiti River river at an elevation of 3,650 metres (11,980 ft) above mean sea level, is the largest township and commercial center of the valley . packed with shops and eateries, is the centre of attraction of the town, and Scandal Point, associated with the former Maharaja of Patiala’s escapades, offers a view of distant snow clad peaks. It is built on and around five hills, Kathalagh, Potreyn, Terah, Bakrota and Bhangora. Located on the western edge of the Dhauladhar mountain range of the Himalayas, it is surrounded by snow-capped peaks. 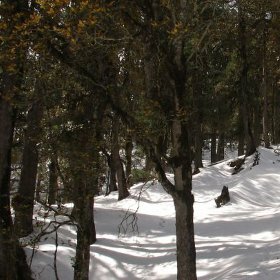 Dalhousie is situated between 6,000 and 9,000 feet (2,700 m) above sea level. The best time to visit is in the summer, and the peak tourist season is from May to September. Scottish and Victorian architecture is prevalent in the bungalows and churches in the town. Chamba is an ancient town in the Chamba district in the state of Himachal Pradesh, in northern India. According to the 2001 Indian census, Chamba has a population of 20,312 people. Located at an altitude of 996 metres (3,268 ft) above mean sea level, the town is situated on the banks of the Ravi River (a major tributary of the Trans-Himalayan Indus River), at its confluence with the Sal River. Tribal Circuit is located in the magnificent and beautiful State of Himachal Pradesh. You can enjoy the scenic landscape of river valleys, snow capped peaks, high passes, icy lakes, and have a look at the glaciers. The place is full of temples and you might come across priests, monasteries, lamas, and yaks. Some of the places that are included in this circuit are Shimla, Sangla, Kalpa, Tabo, Dhankar, Kaza, and Pin Valley and others. Located in Himachal Pradesh, it is known to be the land of beauty, where everything you see will mesmerize you. The beautiful mountain terrain, remarkable valley, orchard farms, and cold desert mountains are some of the things that will have enchanting affect on you. This place is also quite well known for flora and fauna, which is nowhere else. There are quite a few valleys that have always attracted tourists from all over the country. 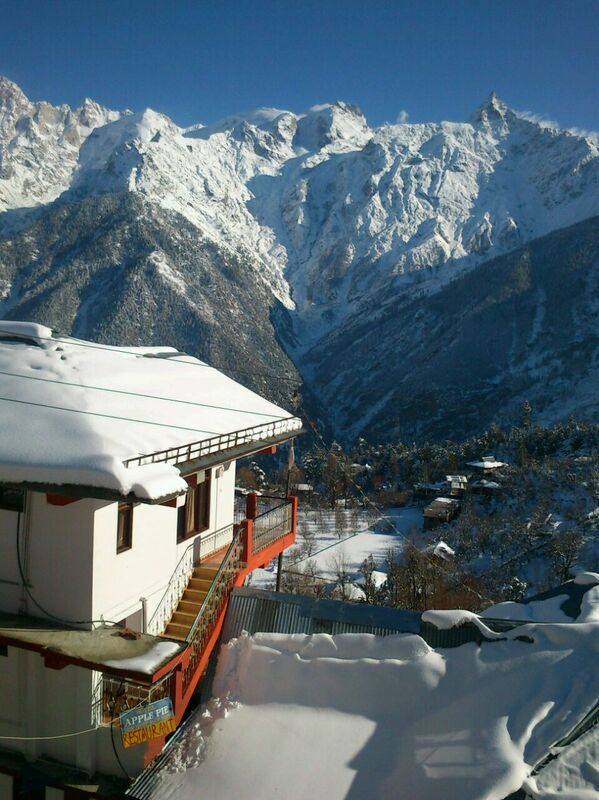 Kalpa is another place in this circuit located at the height of 2578 meters above sea level. Here the tourists can enjoy the view of magnificent peaks and mountains. Every site is beautiful and will steal your heart. Recong Peo, Kothi, Riba and Sangla valley are some of the interesting places that are worth visiting here. Shimla is a beautiful hill town that is located at the height of 2788 meters above sea level. It has been quite famous since British era. There are many beautiful hotels, valleys, and tourists places that are worth visiting here. Due to pleasant climate, it is still the most favorite destinations’ of the country. It is usually chosen by honeymooners and picnickers. The Kinner Kailash range and other mountain ranges make it more memorable. One of the spectacular scenes that you can never miss here is the one where the sun rays touch the peak of snow capped mountains. The closest airport to this place is like 267 kilometers away from this place. Apart from that you can always hire private taxis and also board State transport to reach this place. You can also reach this place via Kalpa –Manali or Rohtang Pass route. The winters here are extremely cold, so the perfect time to visit the place is in the beginning of the year. This peaceful and beautiful place is located at the height of 3600 meters above the sea level. Also it is located on the banks of the famous River Spiti. The name has been given by both India and Tibet, due to the tie up between both of them. It is one of the coldest regions, so you need to be very careful while planning to visit this place. The place is surrounded by beautiful mountains and peaks that makes it all more interesting and worth visiting. The valleys, snow covered mountain peaks, and green valley all are beautiful and attract people always. Since ancient times, this place is believed to be a place where Gods and Goddesses resided. The beauty of the place and its majestic scenic beauty authenticate this version. Some of the places that are close to it are Manali, Kulu, and Shimla. So you can plan an extended holiday and visit all these places at the same time. The climate here is extremely cold during winters, and barely gets any rainfall. The region gets water from melting snow, and during winter the temperature sometimes goes down the freezing point. So if you are planning to visit this place take along with you good warm clothes that will keep you secured. Some of the interesting places that are worth visiting here are Tabo, Key Gomap, Dhankar, and Chander Tal Lake. This lake is known to be one of the most beautiful lakes in whole Himachal Pradesh. This is another place that is located at height of 2250 meters. The place is quite exciting and has good numbers of mountains, peaks, and valleys that look beautiful throughout the season. This place can be easily reached through roadways and it is quite close to Manali, which is 115 kms away from this place. It can be reached by air also whereby the nearest airport is located 175 Km away at Bhuntar. This place experiences heavy snow fall during June and thus the Rohtang pass remains close during this time. Situated in the western part of the Himalayas is the state of Himachal Pradesh. This beautiful state which is adorned with exalted snowy-mountains, meandering rivers and streams, superb biodiversity and absorbing ethnic diversity. Owing to its diverse topography, climate and vegetation, the land witnesses an immense variety of flora and fauna. 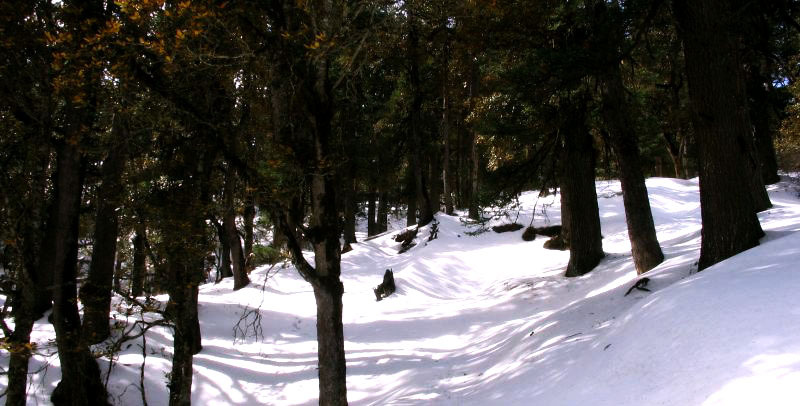 The forests of Himachal Pradesh located at different altitudes are home to numerous species such as Snow leopard, Black bear, Himalayan ibex, Brown bear, Serow , Himalayan tahr, Musk deer etc. To protect the wildlife of Himachal Pradesh, the government has established a number of protected areas. The national parks and wildlife sanctuary protect the rich bio-diversity of the state is thus home to numerous rare and endangered species of fauna. 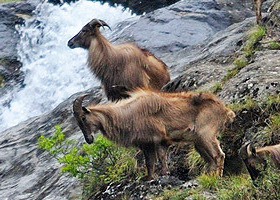 So if you are an animal-lover, then Himachal Pradesh Wildlife will surely enthrall you with its most diverse colors. Moreover, the flora of the region consists of cedar, pine, fir, birch, oak, spruce, grasses, ferns, alder, wild flowers and rhododendron. The avi-fauna of the region comprises pheasants, partridges, patient kites etc. The famous sanctuaries in Himachal Pradesh are Chail Sanctuary, Churdhar Sanctuary, Daranghati Sanctuary, Kalatop Khajjiar Sanctuary, Kanwar Sanctuary, Maharana Pratap Sagar Sanctuary, Majathal Sanctuary, Manali Sanctuary, Simbalbara Sanctuary. The national parks in Himachal Pradesh are Nature Park Gopalpur, Nature Park Kufri, Nature Park Manali, Great Himalayan National Park and Pin Valley National Park. So plan a visit to any one of these and have a look at the rich wildlife. There is no denying to the fact that wildlife in Himachal pradesh has contributed a lot in flourishing tourism. People love to visit the sanctuaries in Himachal Pradesh that are mapped in different parts of the state. One of the famous hill stations in the state of Himachal Pradesh, Chail is a top destination among travelers. Wildlife lovers enjoy their visit to the famous Chail Sanctuary which is located amidst dense forest cover and lush green environs…..If folks are to be believed then Himachal Pradesh is truly a wonderland for travelers. The state has always attracted vacationers to its impeccable locations and sites. 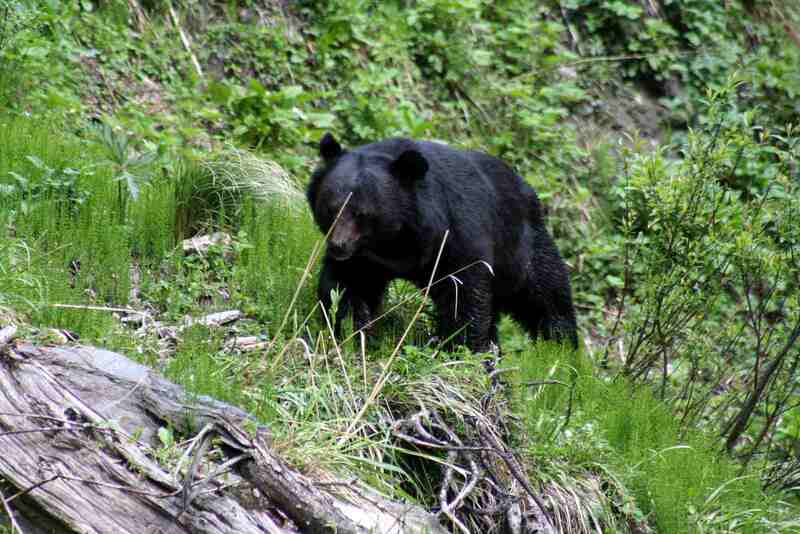 Chail Wildlife Sanctuary is one such destination where you will find the nature at its best. Located at a distance of 49 km from the capital of Himachal Pradesh, Chail mesmerizes every tourist with its very first sight. The Chail Hill station is one of the topmost pick for a perfect holiday in the laps of Mother Nature. Sightseeing in Chail takes you to some of the most astonishing sights that will startle you with its unequalled beauty. Chail hill station offers a perfect time to rejuvenate oneself amidst the lush green forests, snow-covered mountains and meadows outnumbered wild flowers. 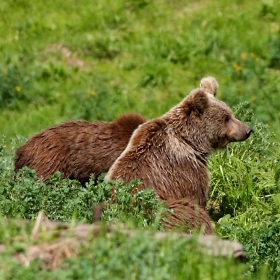 A tour to the Chail wildlife sanctuary is the feast to every animal-lovers eye. 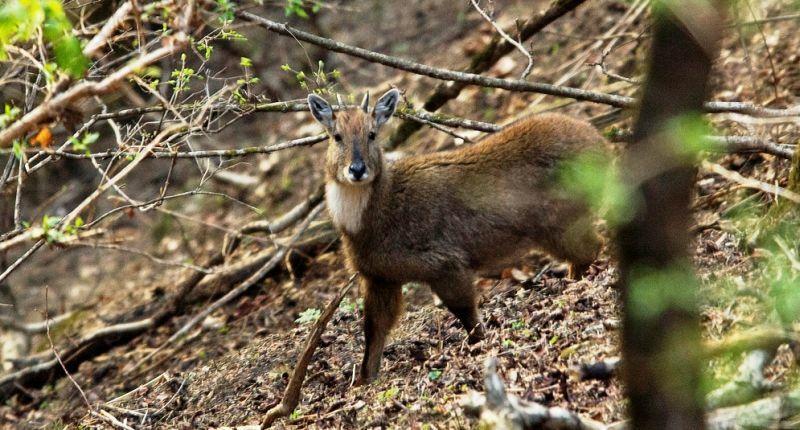 Here one can see some of the rare and endangered species namely Sambar, Goral and Cheer Pheasants, Barking deer and Kalijin. 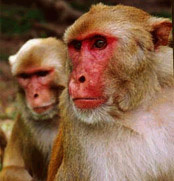 Moreover, one can find Rhesus Macaque, Indian Muntjac, Leopard, Crested Porcupine, Himalayan Black Bear, Wild Boar, Black-naped hare and common Langur among the large mammals. Apart from its animals and birds, the Chir Pheasant breeding farm is an important attraction site at the Sanctuary. In 1988, the Chir Pheasant breeding and rehabilitation programme was started so as to preserve them from being getting extinct. Besides being largely covered with grasslands, the forests have a dense cover of Oak and Pine that fill the air with their scented aroma. Thereafter, you can head on to some other tourist attractions that are a must for Chail sightseeing such as the Chail Palace, Sidh Baba ka Mandir, Cricket Ground, Kali ka Tibba and Chail Gurudwara. To make your trip to Chail more fascinating and a perfect example of luxury and comfort you can head on to the nearby hotels and resorts that offer lodging facilities in the region. Moreover, you can also opt to their world-class amenities that too within the most affordable prices. Every trip to Himchal Pradesh is incomplete without a visit to the great Himalayan National Park. Located in the region of Kullu, the park is spread across an area of 1,171 sq km, at an altitude of 1600 m above sea level. This park is dwelled with rich diversity of flora and fauna. Apart from this, four major rivers that originate from the glaciers in the Park that are a vital source of water to the rural and urban centers the nearby region. This beautiful park has a great significance in the Himachal tourism sector. Every tourist who steps down on this land makes sure to pay a visit to the great Himalayan national park. 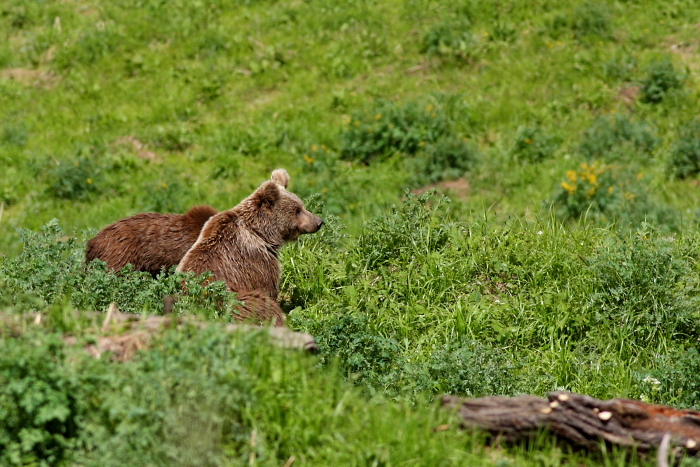 The park is home to numerous rare and endangered species of animals, reptiles, birds and mammals. This in itself explains the richness of the park in terms of the natural bio-diversity. At a trek of about 35 to 45 km in the Park’s valleys one can see the habitat of animals such as the blue sheep, snow leopard, Himalayan brown bear, Himalayan thar and musk deer. The best season to visit the park is autumn during the months of September to November when the seasonal migration of the animals to lower altitudes starts. The Himalayan national park, Himachal also inherits a vast diversity of plants owing to its undisturbed habitats and high altitude range. One can witness interminable vegetation in the park from pines, spruces, horse chestnuts, alpine herbs and junipers. The park is protected under strict guidelines of Wildlife Protection Act of 1972 and hence hunting of any form is not countenanced within the premises. The active efforts of the Himachal Pradesh government & forest department have enabled this park to get recognition the Indian National Park system. So if you wish to visit Himachal Pradesh then make sure to make a stop at the great Himalayan national park. You will surely fall in love with its rich bio-diversity and natural beauty. Established in the year 1984, the Manali Wildlife Sanctuary is a notable attraction in the Kullu district. Spread across an area of 31.8 sq. km this wildlife sanctuary lies within the altitudinal range of 2,273 to 5,173 m. The entire sanctuary has a rich diversity of flora and fauna that amazes every traveler to this region. Manali is one of the top destinations for vacationing and is loved for its matchless splendor and beauty. Every year this place is flocked with honeymooners, couples, nature lovers and adventure freaks. While those who love to be surrounded with the most peaceful air of the region love the serenity of the place, those who desire for some escapades indulge into skiing, mountaineering, para-gliding etc. Here one can find some rare species of birds and animals, scenic landscape and an overflowing tributary of the river Beas (Manalsu Nullah). Visitants can duplicate their pleasure by indulging into activities such as trekking, nature trails, bird watching and wildlife viewing during their Manali sightseeing tour. The flora of the sanctuary comprises Walnut, Kail, Deodar trees, Horse Chestnut, Maple trees to name a few. The list of the animals and mammals species at the sanctuary includes Musk deer, Himalayan Black Bear, Monal and Brown Bear, Himalayan Palm Civet, Goral, Indian Hare, , Barking Deer, Flying Fox, etc. 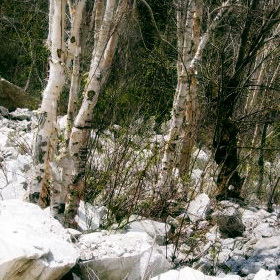 Apart from theses, the Manali Wildlife Sanctuary is home to Stripped Hyena, Serow, Leopard, Himalayan Yellow Throated Marten, Himalayan Tahr, Kashmir Flying Squirrel and many more. To make your tour to Manali more exciting the region has some notable attractions that are the love of every traveler to this land. To make your sightseeing in Manali more exhilarating, pay a visit to Rohtang pass, Hidimba Devi Temple, Tibetan monastery, Jagatsukh, Kothi, Arjun Gufa, Club House and Nehru Kund. Apart from these aforementioned attractions, Vashisht, Marhi, Rohla Falls, Solang Valley and Mountaineering Institute are the other attractions worth a call. To make your stay in Manali a perfect blend of luxury and comfort the region has numerous Budget Hotels in Manali that provide world-class services within affordable prices to the guests. Himachal Pradesh has always startled travelers with its boundless beauty and natural splendor. The snow-covered mountains, peaked hills, lush-green forests, scented air and widespread meadows add up to the beauty of the state. Such is the charm of this place that travelers love to come back here again and again and are yet served with something new on their next visit. The state has in its laps numerous attractions that astonish travelers. One of such attractions is the Pong Dam which was constructed in the year 1976 by damming up the Beas River. The Pong Dam Lake is the largest standing water body in Himachal Pradesh. Lying between the outer Shivalik and DaulaDhar, this lake holds utmost significance in the chapter of Himachal Tourism guide. Located around this lake is a wildlife sanctuary known as the pong lake wildlife sanctuary. The sanctuary with limited submerged aquatic vegetation is visited by tourists who love to unveil different faces of nature. The level of the Pong Lake hovers between the ranges of 335 m to 436 m.
Pong Dam Lake Sanctuary situated in the Kangra district of Himachal Pradesh, the sanctuary is spread across an area of 9675 sq. km . Home to numerous rare and endangered species of flora, fauna and avi-fauna, the sanctuary is a notable attraction sight in Himachal Pradesh. 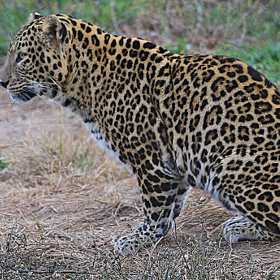 Animals like Sambar, Barking Deer, Wild Bear, Nilgai, Clawless Otter and Leopards comprise the fauna of the sanctuary. Whereas, the avi-fauna varieties include black-necked grebes, large cormorants, Indian shag, black stork, red-necked grebes, eastern grey heron etc. Apart from these animals, pintails, egrets, Brahminy ducks, sarus, Indian moorhens and Indian purple moorhens are the other species at the sanctuary. Moreover, during your visit to the Pong Lake Sanctuary you can come across some of the reptiles such as Common Cobra, Python and Common Monitor along with some fishes namely Mallip, Soal and Mahseer. So what are you waiting for? Pay a visit to this diverse land that is blessed with a rich natural bio-diversity. There is no denying to the fact that Himachal Pradesh is blessed with a rich natural bio-diversity and beauty. The snow-clad mountains, lush green valleys and rambling rivers accompanied with numerous species of plants and animals inhabit this land. To protect the rare and endangered varieties of flora and fauna, the state government has established numerous wildlife sanctuaries all over the state of Himachal Pradesh. The Simbalbara Wildlife Sanctuary located in the Sirmour District (Paonta Valley) is one such habitat for the creation of nature. Simbalbara sanctuary has a dense Sal forests with grassy glades that adds up to its beauty. 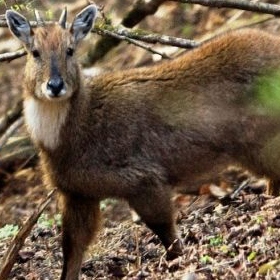 Located on the lower hill of Shivalik ranges in Indian Himalayas,Simbalbara sanctuary is the abode of animals such as Goral, Sambhar, Chittal, Spotted dear and other distinguishable ones. The keen efforts of the Travel & Tourism department of the state have led to the preservation of the sanctuary and that too in its natural form. A trek around the sanctuary takes tourists to some of the most magnificent sights that will amaze them. The surrounding tall trees and far-away mountains add up to the pleasure of the excursionists. For the comfort of the travelers, the government of Himachal Pradesh has built a rest house nearby the sanctuary which is equipped with all the requisite facilities and amenities. Apart from relaxing out at the rest-house, you can gather some Simbalbara wildlife sanctuary information from the people at the place. 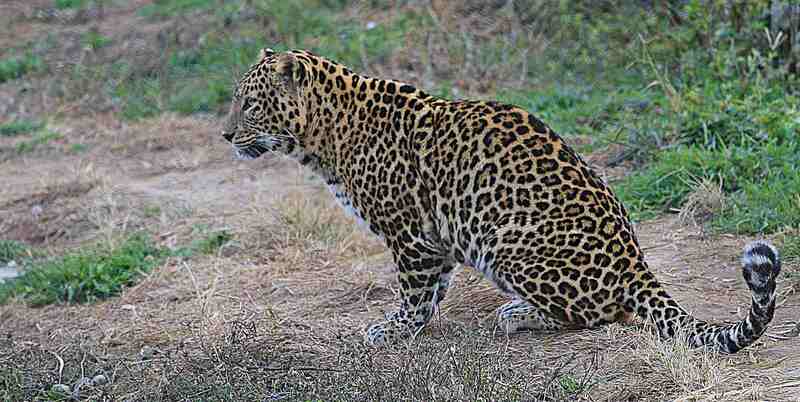 The best time to visit Simbalbara Sanctuary is between the months of October and February. One can easily reach out to this place via road through Nahan, Paonta Sahib and other major cities of Himachal Pradesh. Moreover, you can boards a Private taxi or opt for a state government bus service that is available from Sirmaur district. For nature lovers, Simbalbara sanctuary has all in store to suffice their passion. And don’t forget to take your camera for who knows what you may come across. Such is the beauty of this place that you will make numerous clicks throughout the trek to the Simbalbara Wildlife Sanctuary.